A while ago I wrote an article about adding VMware integration to your ACI fabric. This is of course a very important step, as about 70% of people’s workloads are virtual. However, that number has been pretty static over the last few years. We don’t see many environments that are 100% virtual because some applications just run better on physical servers. They’re not even all legacy applications. There are new applications such as big data using Hadoop that require physical servers. So, I thought I’d write an article on how we connect physical, or bare metal, servers to the ACI Fabric. It’s not too difficult but we can’t just plug it in and expect it to work. There are a few things that need to be done first, which I’ve covered in various articles already. If you haven’t already, you’ll need to configure Switch Profiles and Interface Policies for your bare metal servers. 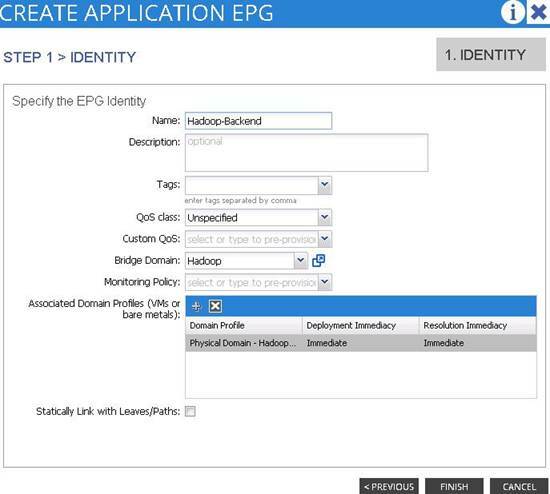 When you’re configuring these profiles you’ll need to figure out whether to use CDP or LLDP. You’ll also need to create a separate AEP for it. After that you can associate the AEP with a physical domain. 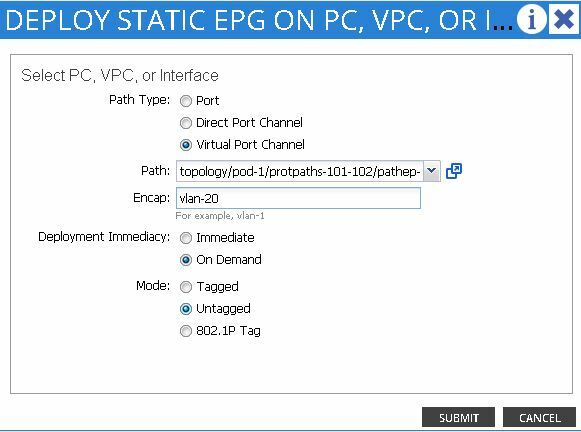 Use the pulldown menu and select Create a VLAN Pool. 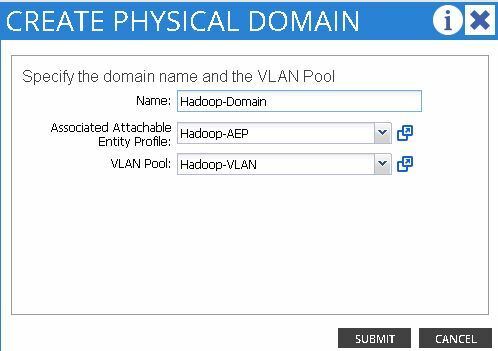 Create the VLAN Pool according to the VLANs you’d like the physical servers to be able to connect to. Most likely you already have tenants, VRFs, and bridge domains but if not you can reference this article to create them and understand what they are. Also keep in mind that all of the previous steps listed in this article, and for that matter the ones I’m about to go through can be automated and orchestrated by issuing API calls to the APIC using something like the Postman REST client. For more information on that check out this article. Now that we’ve gotten all the basic stuff out of the way let’s go ahead and get our physical servers connected. Click on Tenants at the top and select the Tenant you’d like to work with (this is very important as you don’t want your bare metal servers getting added to the wrong tenant). In this case we’re going to create a separate Application Profile and End Point Group to put these servers in, but if you already have an EPG you’d like to add them to that will work as well. Click Submit. You could go on and create an EPG here easily as well, but I’m going to do it in two different phases for the sake of the article. Now that we have an Application Profile, we can expand Application Profiles in the navigation tree and select our new Application Profile. From here we will create an EPG. Most likely you’ll also want to change the Deployment Immediacy and Resolution Immediacy to Immediate. You’ll notice I changed the Deployment and Resolution Immediacy to Immediate instead of On Demand. Setting the Deployment Immediacy to Immediate will send the policy to the leaf right now and setting the Resolution Immediacy to Immediate will have the leaf apply the policy to the hardware right now. If you set it to On Demand it will wait until a workload appears that requires that policy. Now we have an EPG and we could go in and create other EPGs and assign Contracts (or Policies) to them, but that will be addressed in a future article. Select the Path Type. This comes back to how you created your Switch Profiles and Interface Policies. Hopefully you created a VPC for redundancy. If so, select Virtual Port Channel. If you only have one connection from the server to one leaf then just choose Port. Select the Path using the pulldown menu. Your path should be in there if you created the Switch Profiles and Interface Policies. Put in the VLAN you’ll be using (make sure it’s a VLAN that’s in the pool you specified earlier). Follow these guidelines to assure that devices that require untagged packets operate as expected when they are connected to access ports of an ACI leaf switch. When an access port is configured with a single EPG in native 802.1p mode, it’s packets exit that port untagged. For the other EPGs, packets exit with their respective VLAN tags. When a leaf switch is configured for an EPG to be untagged, for every port this EPG uses, the packets will exit the switch untagged. When an EPG is deployed as untagged, do not deploy that EPG as tagged on other ports of the same switch. At this point you should have connectivity for your server. Try pinging the gateway of the bridge domain to make sure you have connectivity. Also keep in mind that if you don’t have contracts created yet, you won’t be able to ping any servers that are in other EPGs, but you should be able to ping servers in the same EPG. This is because Cisco ACI uses a white list model, which again we will go over in another article. If you have questions or comments please leave a comment below this article or reach out to me on Twitter @Malhoit.